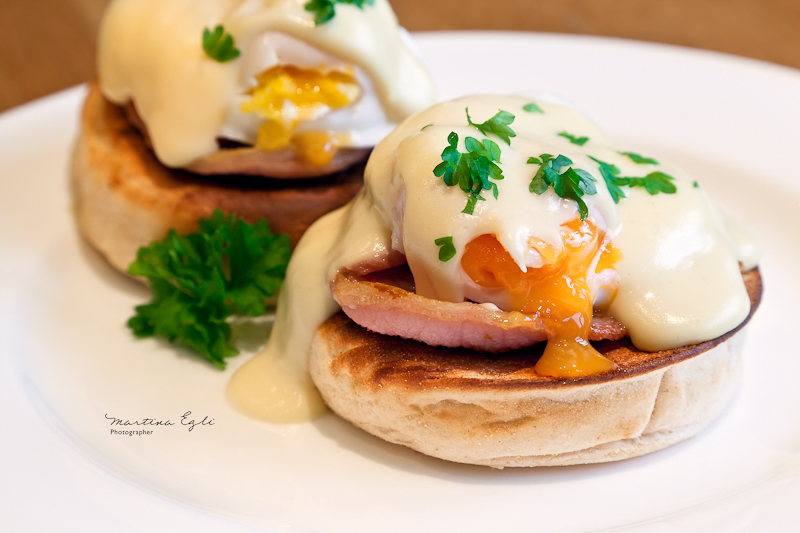 …and if you’re going to have a leisurely breakfast what better breakfast than Eggs Benedict? These Eggs Benedict just popped out of my computer screens. Wow, do they look tasty! Perfect photo of this breakfast!!! I realy like it! This looks absolutely delicious. I once watched a film about the secrets of food photographers and many of their tricks to make the food look better and last longer were products you’d not want to consume. In the case of Eggs Benedict I’d have to make some for photographing and some for eating. I’ve always considered this dish a special treat for a special occasion/morning. Wonderful job, Martina! Delicious 🙂 Great food photography. Hi Krunal, for Eggs Benedict one or two slices of bacon on a toasted English muffin topped with a poached egg and then drizzeled in Hollandaise sauce – garnish for effect. It sounds strange but it’s quite delicious. If you don’t fancy bacon you can replace it with spinach and you get what’s called Eggs Florentine (also delicious.) Have fun in the kitchen! Looks delicious! Very well executed. Where are you getting these quotes from? I love this series! !